In Boston, that pesky paperwork you're supposed to fill out comes to you. How did it take so long for this to happen? Boston's Brutalist City Hall building, designed by Paul Rudolph, may be the least popular City Hall in the country. It has only two stars on Yelp. And, like all government buildings, it is the site of bleak bureaucratic pilgrimages in search of forms and documents. So Boston is putting the city back in City Hall. Last month they started "City Hall to Go," a truck that visits different locations around the Boston, giving residents a mobile lab through which they can pay parking tickets, register to vote, report neighborhood problems, request a birth certificate, and so on. 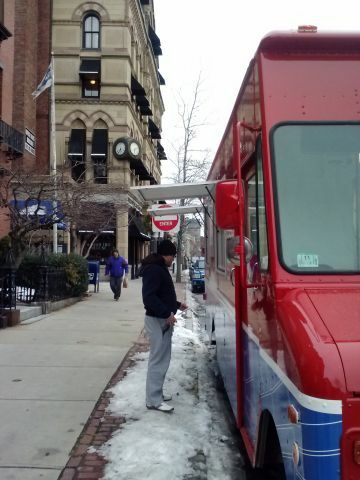 The City Hall to Go truck in Charlestown, courtesy City Hall to Go, via Twitter. The project was inspired by the city's many food trucks, and like those, its location is updated via Twitter each day. The slogan? "Convenience Served Fresh Daily" The truck even has a "menu" with five categories: Car, Family, Home, Pets and Plus. The city hopes that City Hall to Go, which houses a high-powered, Internet-ready office space, will become a fixture at civic events like block parties and neighborhood festivals. The National League of Cities reports that it is the nation's first mobile City Hall. City Hall to Go from Kris Carter on Vimeo.